Good Breakfast, we were the first. Few hours later, we reach Mestre, Veneto, Italy for early lunch (Taiwan Food). Venice is the consummate magician. It makes marble palaces vanish into silent fogs, labyrinthine calli (streets) disappear at the whim of moody tides, and can even turn the most pedestrian of people into fantastical, masked creatures. Venice made up of a group of 118 small islands separated by 177 canals and linked by 409 bridges, it is no wonder that the city is also known as the “City of Bridges”. 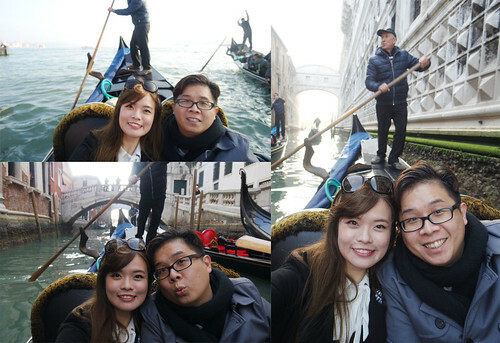 Gondola Ride is a must-do in Venice. We loved this amazing experience. The weather was great and the scenery is beautiful!! Gliding through serene waters, while serenaded by your gondolier, against the stunning backdrop of Baroque buildings is an experience you won’t soon forget. After pizza time, dessert and cappuccino time at Kori Ristorante Pizzeria. Walking from St Mark’s Square and St Mark’s Basilica. Giving the broad expanse of Piazza San Marco its vertical dimension is the campanile, the tall brick bell tower for the basilica. This charming square forms a wide promenade between the Grand Canal and Piazza San Marco, which flows into it in front of the basilica. Few hours later, heading back to the port terminal. Our day ended as we made our way to Alexandra hotel for the night.